The Minnesota Vikings have struggled to field a consistently competitive team in recent years, but they have proven occasionally adept at identifying top offensive players in the draft, and that includes Cordarrelle Patterson. Patterson got off to a slow start as the team figured out how to use him properly, but he put on a strong finish to the year and caught the eye of many collectors. 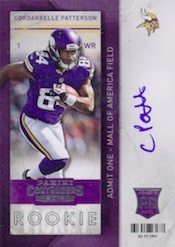 Because of this, Cordarrelle Patterson cards are among the hottest rookie options in the 2013 NFL Draft class. While he is clearly a gifted athlete, Cordarrelle Patterson did not take the normal path to the NFL. Despite putting forth a good senior season in high school football, academic issues prevented him from signing with a major college program. The former track star then made the move to North Carolina Tech Preparatory Christian Academy in 2009, but he did not play football. Patterson finally got his chance to shine while spending two seasons at Hutchinson Community College. His success on the field resulted in multiple SEC scholarship offers and he eventually signed with the University of Tennessee in 2012. Although he is primarily a wide receiver, the multi-faceted athlete was a terror for opposing SEC defenses, and he was also deployed as a returner and running back. After just one season at Tennessee, Patterson declared for the NFL Draft. With the departure of their all-purpose stud, Percy Harvin, the Vikings traded up to select Cordarrelle Patterson with the 29th overall pick and hoped he could fill the void. Early results indicate that they made a good call. Although the Vikings struggled to incorporate Patterson in their offense to start the season, he saw plenty of looks during the end of the season. Patterson was named the December Rookie of the Month and also made the Pro Bowl as a punt returner. His sophomore effort has been uneven, but the team is still committed to getting him more touches. Obviously, Cordarrelle Patterson still has a long way to go to approach the elite wide receiver level. Given the team's ongoing search for a starting quarterback, his full potential will not be realized until a legitimate franchise quarterback emerges and many believe that could be Teddy Bridgewater. If that happens and he continues to develop, Patterson could become one of the best overall players in the league over the next few seasons and his card values will make a big leap. 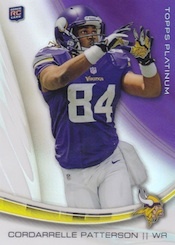 A full rookie checklist of Cordarrelle Patterson cards can be found on the next tab. With nearly 40 rookie options, collectors have a good overall variety of cards. Also, while they are college themed, Patterson was featured in 2012 Exquisite Football, as well as multiple 2013 Upper Deck products, and many of these are popular with collectors. CORDARRELLE PATTERSON 2013 ABSOLUTE ROOKIE PREMIERE TRIPLE JERSEY PATCH RC 99!! 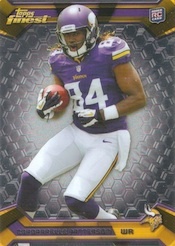 2013 Topps Chrome #4- Cordarrelle Patterson "1959 Topps" Mini RC! PSA GEM 10! 2013 Rookies & Stars #204 Cordarrelle Patterson 31 299 Event Material Rookie!